Here I shall describe my Mother Spaceship concept. My goal here is to achieve physical realness, except for the energy generator, hyper-drive and other technical details about interplanetary drives, etc. 1) The ship is several kilometres in length and between 100-200 meters in diameter. 2) The ship uses a rocket engine propulsion system. The engines are identical and placed symmetrically on the ship. In addition for reasons of realness the ship is similar in layout to a skyscraper building, instead of the submarine design which we are so accustomed to seeing in games and movies. The engines are at the bottom of the ship and therefore when flying with acceleration, the "gravity" will be directed "downwards" towards the engines. 3) Engines and tanks contain a working substance in them (the reactive mass), which occupies 30-70% of the ship's volume. 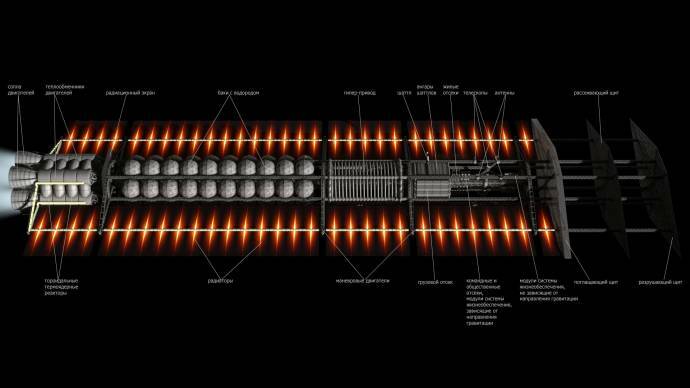 It is important to consider how the engines are arranged, as they're not chemical, I.e. the energy source and reactive mass (working-substance, propellant) are different things. The engines are very powerful, and can accelerate the ship to 5-10 G, and has a stock characteristic speed ("delta-V") in the order of 1000-10,000 km/s from just one refuelling. (It gives the ship ability to change speeds. I.e. the ship can be accelerated to 100 km/s and stopped several times just from one refuelling). The working substance is crystallized hydrogen, water and some other thing that can be easily collected from space. 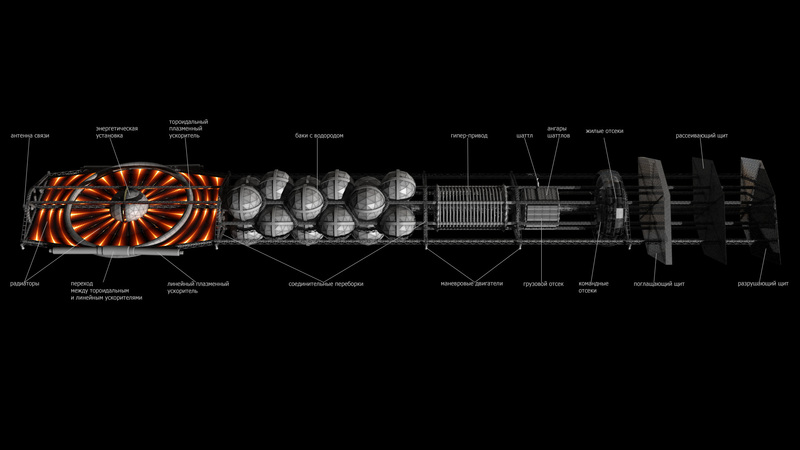 4) The energy plant is a separate reactor or combined with engines (fusion engines allows to produce electricity). In the second case, some energy batteries (quantum condensers?) are needed to power ship systems then engines are shut down. 5) The external part of the hull is covered by heat radiators for engines, reactor and habitation/cargo modules. Radiators for engines, reactor and habitation module are different, because they work with different temperatures. 6) There is an anti-meteorite shield in the forward part of the ship. Flying at a speed of 1000 km/s in the interplanetary zone will create the effect of a continuous bombardment of sub relativistic micrometeorites. The shield itself may need to be replaceable, or have separate replaceable modules, or maybe have some kind of magnetic energy shield. The shield should cover all parts of the ship against the flow of space matter; it is therefore necessary to place it more compactly and closely to the longitudinal axis. 7) The cargo and habitation modules are placed behind a meteoric shield, surrounded by a radiation shield. On its surface there are different hatches, air-locks, hangars, viewing decks, telescopes and other sensors, weapon loop-holes etc. What's important is that it's all covered by the forward meteoric shield. 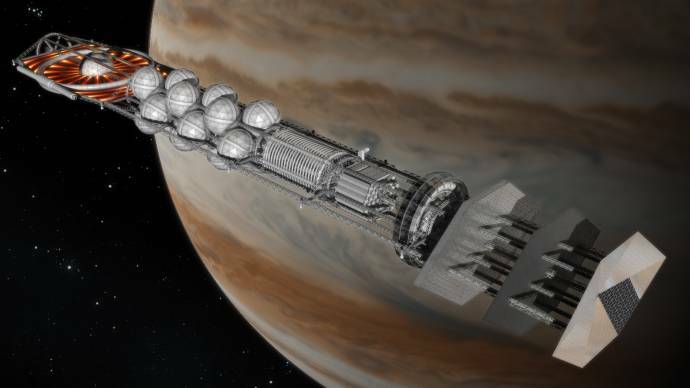 9) The ship has on-board factories, where new shuttles, modules and other devices can be manufactured using resources taken from planets or synthesized by on-board nuclear-conversion reactors. 10) The ship can fly faster-than-light. 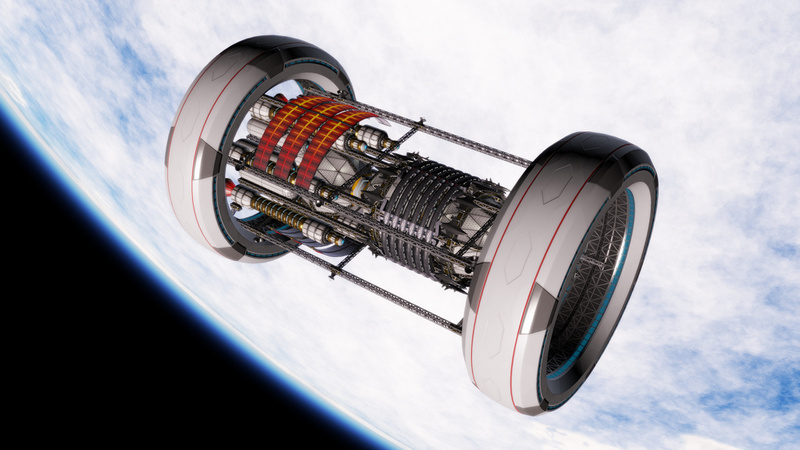 The currently approved concept is the Alcubierre warp drive, so ship must be equipped with two or more large "hyper rings". Look for the default SE ships called "Explorer-1", "Explorer-2", "Doctor Ship" for reference. 11) The Mother Space Ship cannot land on planets. Instead it carries various shuttles, specially designed to fly from space down to planets with atmospheres or airless worlds. Besides shuttles, there are also some repair, cargo and harvesting vessels. 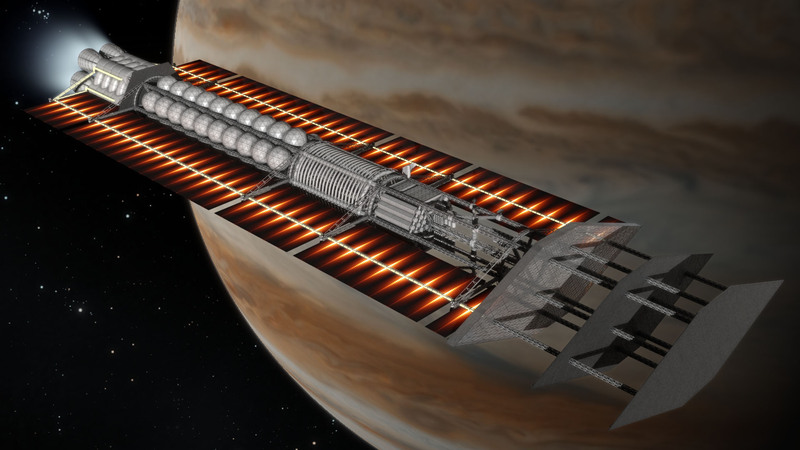 12) There are special vessels with a ram-scoop for collecting hydrogen from atmospheres of gas giants (hydrogen is the propellant for the main engines). Though it is possible to place a ram-scoop behind a meteoric shield. The shield opens up as a bud and puts forward a ram-scoop. Another way to resupply the main ship is by using collector boats for harvesting, for grabbing ice formed comets or icy moons, etc. 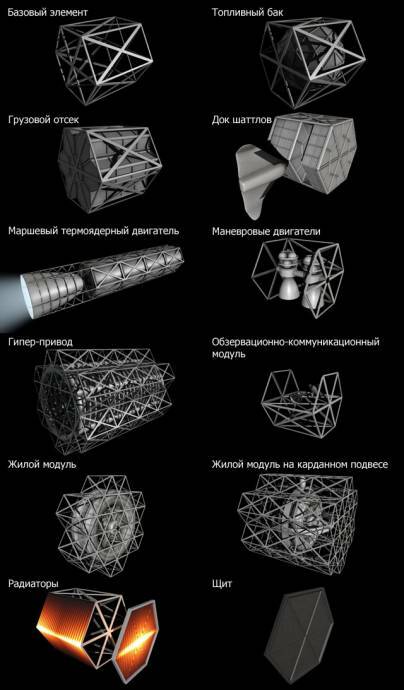 13) There are no limitations on the number of polygons for the models, due to development of technology of adaptive and/or procedural detailization of the ship and its parts. In the beginning, it will be possible to make each part of the ship's model with an independent set of LOD's. 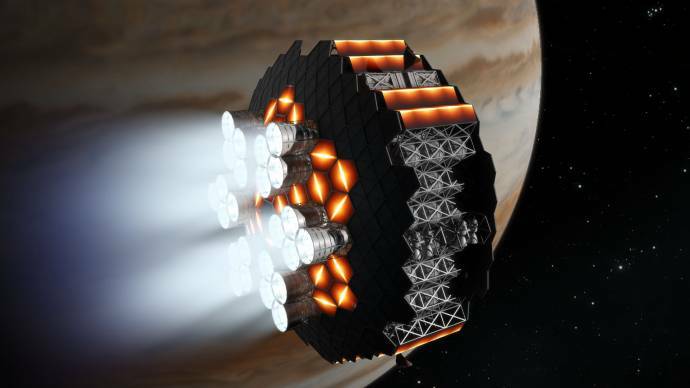 The ship would be built with several replaceable modules - engine, reactor, cargo etc. So this shall provide a good system of upgrade for the ship later. That would be Cool to have an observation deck to hang out in, and view the planet below! How is the mothership for SE coming along? I can't wait until I fly the mothership which is several kilometers long! Thanks! Last edited by Vinny002 on 02 Jan 2017 13:46, edited 1 time in total. As long as the thread's already been bumped, I'm curious to know how much, if at all, the mothership concept has changed by now and how the existing ship editor and its sample ships stack up against it. For instance, reading through the specifications above it seems SpaceEngineer was imagining something like a torchship that would keep its main engines running most of the time, while the editor seems to be mainly focused on ships that spend most of their time in warp or inertial cruise. Formerly known as "parameciumkid." Still playing on Intel HD Graphics 4000 ^^ My computer turns 5 this Summer. That was never the plan. It takes a lot of fuel to keep burning, the plan was always to have an FTL system help in transit time and only accelerate to a few 10x of km/s. The only thing that has changed, and the concept was updated to reflect this, was the addition of the Alcubierre drive. 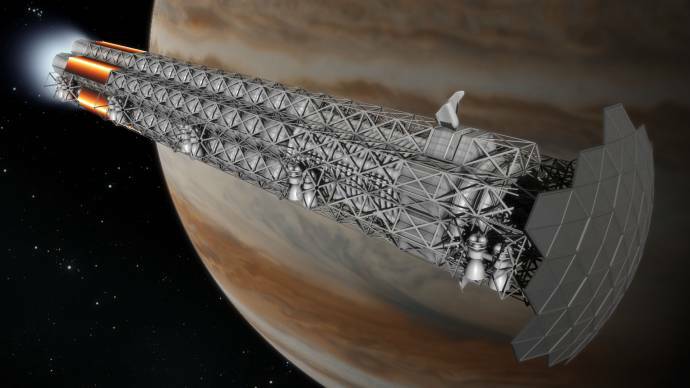 See that makes sense, but in the OP there's a bit about how the ship is designed like a skyscraper with cabins oriented along the axis of thrust, which wouldn't be useful if the ship only spent a fraction of the time generating artificial gravity using the main engines. 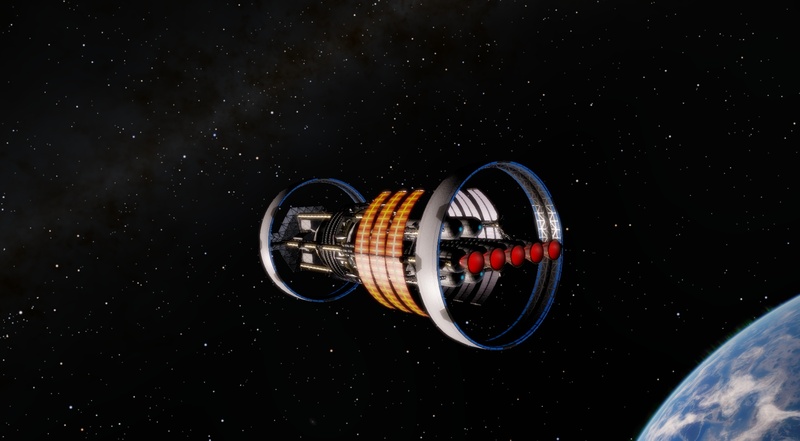 The sections on the habitation ring rotate in the direction of acceleration. This means when accelerating the outer part of the ring is facing in the direction of the engines and when coasting it is facing outward from the ring as they rotate. Oh. Neat idea, albeit somewhat more complicated. 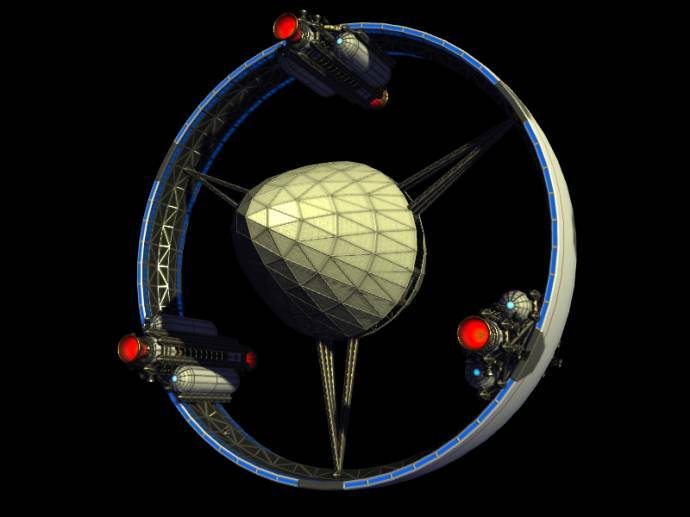 Re-reading number 8, it seems like SpaceEngineer had originally thought up a torchship-esque design with parallel decks but later warmed up to the idea of radial decks with centrifugal artificial gravity, which happen to be what the Editor program builds. As for me I've just been figuring that the captain puts out an announcement when the ship is about to start a burn and then everyone gathers in special sections where they can strap in (or in relevant cases enter a fluid-filled acceleration capsule) to ride it out. every cylinder can contain a 6m x 12m x 4m habitation space. in acceleration the floor rotates 90 degrees and it aligns with doors to connect to the rest of the ship. ettore_bilbo, it would be great if you make the module compatible with SHW's ship editor. You may extract the hab module from the editor's files (modules/toroidal_living_module.obj), load it into blender and use to scale/align your module with it. Then with maybe help of SHW it could be imported into editor. Source of the post Then with maybe help of SHW it could be imported into editor. It's actually pretty easy to import custom objects into the editor since all the scripts can be easily edited. I have added custom objects before, such as fat hyperdrive rings, before SHW added them officially, and other custom modules. Source of the post It's actually pretty easy to import custom objects into the editor since all the scripts can be easily edited. 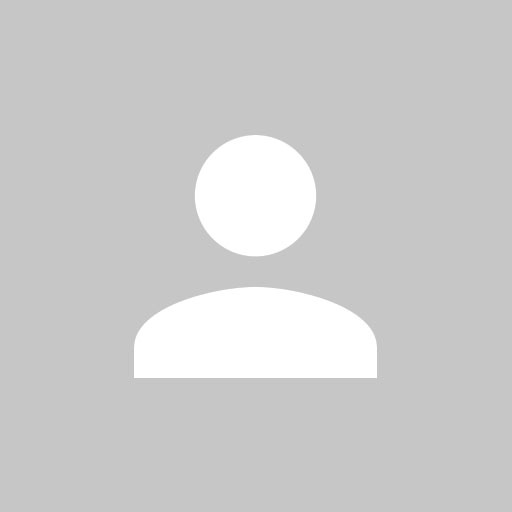 Hi DoctorOfSpace, May I ask you if it's enough edite "module.js" or there is more to do? That might be required, it's been a while since I have done it. Modules.js sounds right, I remember posting on the old forum about it so if need be I can check there. Source of the post I remember posting on the old forum about it so if need be I can check there. thanks... I'll try to look in old forum.